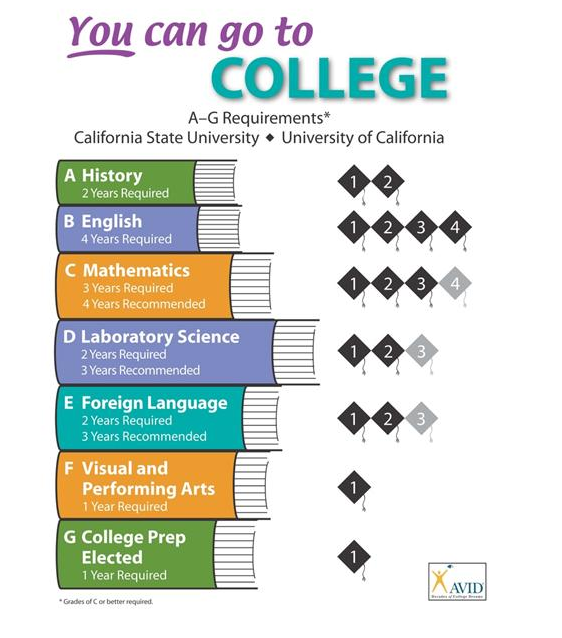 ﻿California Public Universities: If your goal is to be eligible to apply directly to the California State University or the University of California after you complete high school, you must complete the a-g course requirements (above) with a C or better in approved courses. Successful completion of these requirements does not guarantee admission to any particular campus, but rather, means that you are eligible to be admitted. Want to know which courses are a-g approved? Click here for the UC/CSU - Approved Course List for GVHS. Other Universities: If you intend to apply to another university or 4-year college (a private or out-of-state school, for example) it is your responsibility to research the minimum admissions requirements for the school(s) of your choice. Failure to do so in a timely manner could cause you to be ineligible for consideration.